The crystal clear multi-level cascading freshwater pool overlooks the Caribbean Sea leaving you with magnificent views of the islands. Enjoy jet skiing and other water sports or try your skills in a game of sand volleyball. Sapphire Beach Resort is located in a lovely landscaped tropical vegetation garden amidst palm and banana trees. The marina onsite provide boat excursions to many of the other beautiful islands as well as fishing, parasailing and snorkeling adventures. There is a dive shop on property to accommodate your snorkeling and other water activities. There is also a beachfront bar and restaurant located at the waters edge. I fell in love with St. Thomas and the Virgin Islands eight years ago when I purchased my first condo at Sapphire Beach. I now have four condo's onsite and hope to instill my love of the islands with my guests. The beauty and tranquility of the property promotes a relaxing getaway sure to provide amazing memories for all. This property is one of the developments that lies closest to the turquoise waters with glorious views from this renovated condo. It also sits on one of the most beautiful beaches St. Thomas has to offer. The view from the deck offers unobstructive views of the properties' onsite marina with a short stroll to the beautiful beach located onsite as well as the two level freshwater pool at the ocean's edge. 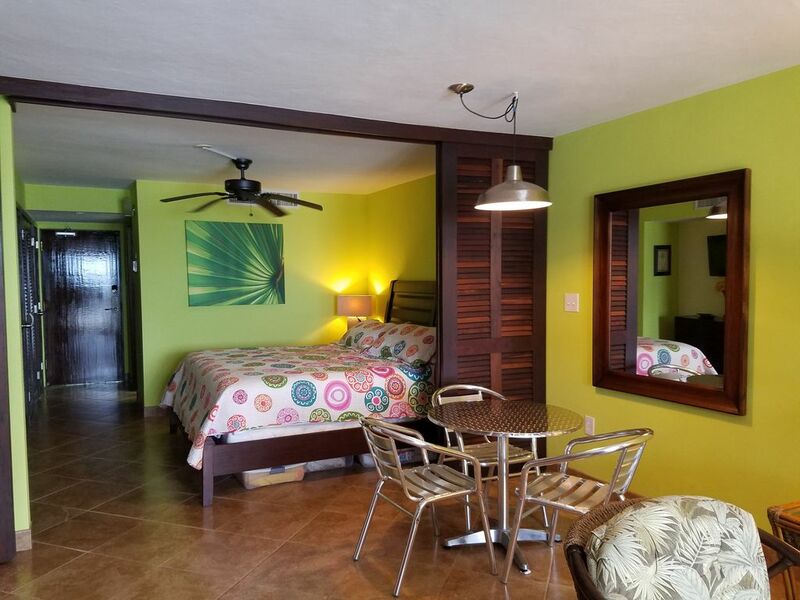 This property is just steps from the onsite marina where you can book a day trip to many of the virgin islands including St. John, Jost Van Dyke, Virgin Gorda and may others. You can also take a sunset cruise, rent Jet Skis or give parasailing a try. There is a laundry facility onsite. You can purchase tokens and laundry detergent from the marina office during business hours. Parking is available in front of the unit. Beach towels are also provided for the guests use. Living room has a queen sofa sleeper and large flat screen TV. There is a microwave, cook top and outdoor electric barbecue. There is a small indoor dining table that seats four along with an outdoor dining table that also accommodates four people with a gorgeous view of the Marina. There are two large flat screen TV's located in the unit. One TV is located in the bedroom with the other located in the main living area. There is a large deck overlooking the marina at Sapphire Beach Resort and Marina. There is a large deck overlooking the newly renovated marina at Sapphire Beach. There is a large two level pool located on the waters edge with magnificent views and cascading waterfall. It is a short walk from the condo unit.